Quick question: how many emails are in your inbox right now? My inbox is currently stocked nicely with 64 emails (with MANY more tucked away in other tabs). Do you often feel overwhelmed by your email? Ding! Yes! Does your email ever shape what you get done in a day, especially first thing in the morning? Ding! Yes! Are you one of those people who wakes up, grabs your phone, (because it’s always within arm’s reach) and checks your email? I can honestly say this is a morning habit I have indeed broken. Thank goodness! 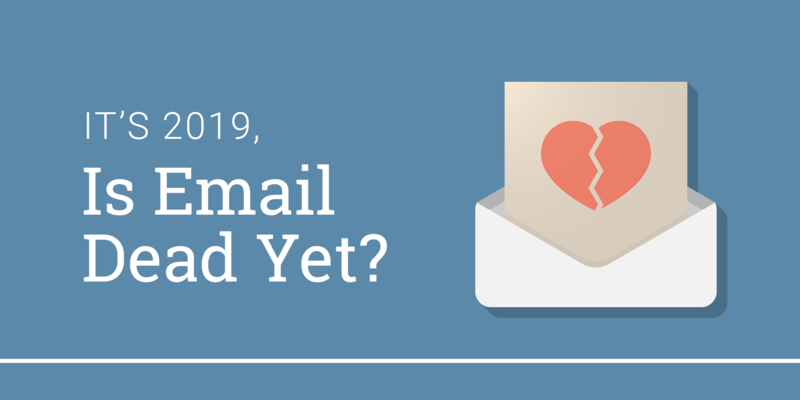 We’re just three weeks into 2019 and I’m already wondering if email is dead. Let’s get real. No, it’s not dead but our patterns indicate what we think of it, how we use it, and what the future may bring for our sometimes pesky little friend, email. It seems like only yesterday when email evangelists were describing the beauty and benefits of inbox zero. Cue the harp and angels. For those of you not familiar with inbox zero, it’s a strict approach to managing your inbox that aims at keeping it empty, completely empty. Read our take on inbox zero here. Fast forward almost seven years later, and there’s a new approach gaining in popularity. In fact, some of you may not even know you’ve been doing it for years! As I learned recently from an NPR story, inbox zero is out and inbox infinity is in. Basically, with inbox infinity, you get all Zen with your email and simply let your email “wash” over you. Best of all, you respond to what you want to and ignore the rest. So, if we’ve got a new approach to managing your inbox that basically tells you not to worry about responding to email, what might that indicate about email in general? We’re getting more email than ever and it’s virtually impossible to stay on top of it. The very second you attain the holy grail of inbox zero, another pile of messages come through. We’re tired of our dependence on email. I’m exhausted, actually. Email isn’t novel, it’s not new, we’ve gotten used to it. After all, it’s been around for nearly 50 years and for the average person nearly all of their “business” career. Zen is making its way into our vernacular. Part of inbox infinity recommends letting your co-workers, friends, family, and others who regularly email you, know that you may not get back to them at breakneck speed. Frankly, that sounds refreshing. You see, I have a bit of a bad habit of frequently checking my email. Remember how great we thought it would be able to check our email from our phones? I do. Fast forward, a decade-plus, our constant ability to check our email has transformed into feeling tethered to an inbox. No, I don’t think email is dead. Nor do I believe that it's passé. I do believe that you need to use email creatively, authentically to stand out and truly connect with people. So, back to managing these beast of a thing. My approach lands squarely somewhere between inbox zero and inbox infinity. What approach is right for you? I’d love to hear your thoughts about email. Take my quick survey here. It’s only three questions!